Enhance your outdoor living space. Protect what you love. Don't settle for standard, design your custom awning now. 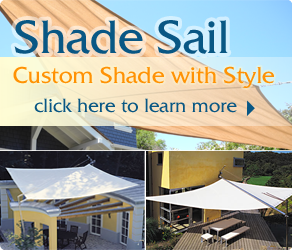 HOME-TECK is your one-stop, custom design shopping experience for Retractable Awning and Shade Sail Awning. With the help of our easy measuring directions, you design your custom awning or shade using our imported European high quality hardware and select from a large selection of famous quality Sunbrella fabrics. We had an old fashioned ugly awning installed too low under the eave. With my 6' 2" I was always hitting my head. Thank you, Home-Teck for recommending a roof-installation. This product made in Italy is a wonderful combination. I will recommend you to all my friends.